SBS will launch Shaun Micallef’s Newstopia from October 10. Simply described as, “A new comedy series by Shaun Micallef who stars as anchorman in this satirical half hour news bulletin,” it will screen at 10pm on Wednesday nights. This effectively means Wednesday nights are about to heat up. Not only do we have The Chaser and Summer Heights High but Prison Break and Damages are also coming on Wednesdays. And that’s without any sign of Heroes and House (both yet to be confirmed). Newstopia will hopefully be Micallef’s own take on current events a la Stephen Colbert, Jon Stewart and Bill Maher ( we assume!). Mick Molloy might want to tune in to this too. Just an idea. I’m sick of the arty use of dying fish – I used to like Micallef but now he’s so busy being meaningful, so far up himself that he thinks watching a living being suffocating, adds to the ‘humour’. I will be watching. By The Way,Ten Has Confirmed House To Return Oct 3rd. 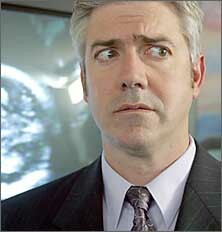 Shaun Micallef is an unheralded comic genius, and I for one am chuffed to see him back on our television screens. The whole newsroom parody has been overdone. I say bring back Frontline. Is this going to be Australias version of The Daily Show? If so, it’s my new favourite TV show!